Type N female input connector, 50 Ohms. 30-500 MHz, 15 Watt and 60 Watt scale. Very clean, works AOK. 50 Ohm, Type N female connector. Used, in excellent condition. 30-500 MHz, 2 Watt full scale. Tested OK down to 1.9 MHz, reads about 10% low at 7 MHz. Below 7 MHz reads a bit lower. With an external attenuator (not included) you can extend the range to 10 Watts, 100 Watts, 1000 Watts, etc (the external attenuator dissipates the excess energy). New old stock, packed in original Bird packaging, new condition. BNC input. Internal 50 Ohm load for up to 1 W.
Bird Termaline(c) 6151 Wattmeter and RF Load. This discontinued Bird Product uses standard Bird 43 plug-in elements and has the same specifications as the industry standard Bird Model 43 Wattmeters. Used in very good condition, works perfectly. Type N female input connector, 50 Ohms. 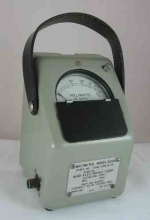 Bird Termaline(c) 6104 Wattmeter and RF Load, four power scales.